AxCrypt is a tool that covers the need of security by encrypting any document desired. 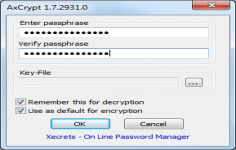 AxCrypt is a software utility specially designed for data encryption. Using the application is very simple since it is directly accessible from the context menu in Windows Explorer by just selecting a folder or file, and then entering a custom encryption key. When it is needed to consult a document, the authentication key is required. If there are changes made to the file, it is automatically encrypted again. Similarly, temporary files are permanently deleted from the hard drive without a recovery is possible later. Encryption is done with a 128-bit key, which makes it impossible for hackers. It is imperative that the password to open a file, otherwise it is impossible. For editing an encrypted file, simply double-click it. It is able to encrypt files that are more than 4 Gb, except for those who are self-extracting. AxCrypt also includes many other features such as administration from the command line or the compression before encryption. Minor update with usability and stability enhancements, various bug-fixes, refactoring, performance improvements and maintenance work. 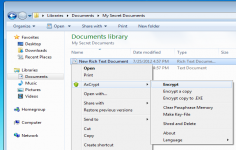 Encrypt extra files in the work folder when cleaning it. Let deleted My AxCrypt folders stay deleted. Removed file is not removed from recent files view automatically, and cant be removed manually. Upgrade to 256-bit from 128-bit encryption. Add structural integrity check of encrypted file. When inactivity signout is disabled, also disable sleep and screen saver sign out. Add verify file function which will not try to decrypt the file, but only verify the HMAC. No file name shown in error message when encrypting pending files. Rename to original causes ArgumentNullException. Password reset should add email=user-email to URL. Do not encrypt hidden or system files. Update subscription status when clicking Try Premium etc. Not all available private keys tried when decrypting shared files. UserKeyPair comparison returns equal when not, sometimes. Getting a public key may not get the most recent valid key. App cache performance is improved.